I received an email this morning from one of my friends in Bangladesh. This young man came to faith in Christ ten years ago when one of my teams distributed copies of the Bible in his village. Of the five Bibles given away in his village, four were later confiscated and burned by Muslim villagers. His was the only remaining copy because he refused to give it up. And because of pressure from his neighbors, he left his village and traveled to Dhaka where he connected with a Christ-follower who led him to faith in Christ and mentored him. Today, this young man leads a network of national evangelists who take the story of Jesus from village to village. His faithful service to Christ is making a difference. In his email, my friend asked for prayer for five house church leaders who are suffering persecution because of their faith in Christ. This past week, these five men were approached by the Muslim leaders in their village who demanded that they disband their house churches. These house church leaders protested that they have the right to follow and serve Jesus and that they must continue to worship and study the Scriptures together. As a result of their refusal to stop worshiping, the local Muslim leaders have taken the following punitive measures against these men and their families. • They will not be allowed to purchase anything at local shops. • They will not be allowed to work for hire as laborers. • Their children can no longer attend the local school. • They will not be allowed access to the village water supply. • Locals will not be permitted to purchase anything from shops owned by Christians. This is not the first time that something like this has happened to Christ-followers in Bangladesh and it will not be the last. Every time I receive this kind of news I am reminded of how privileged I am to have the freedom to worship as I please in America. And I am also reminded of my responsibility to pray for Christ-followers who live in places that are hostile to the gospel. Because these five house church leaders refused to disband their churches, they will pay a high price. They will have to walk farther to buy food, find work, fetch water, and get their kids in school. But they are willing to pay the high cost of believing in Jesus and telling others about His redemptive work on the cross. We must do no less. Thank you for sharing this with us. 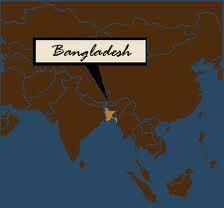 We will pray for our brothers and sisters in Bangladesh.